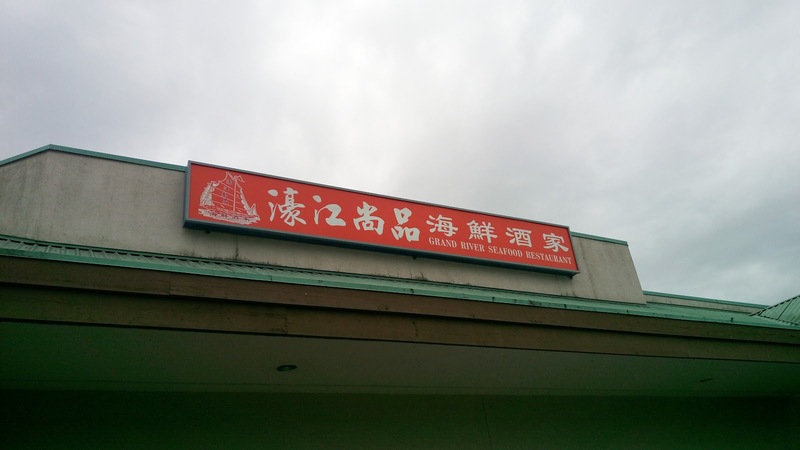 From the outside, the restaurant didn't look too appealing, but as I entered, I was comforted by the simplicity of bright lights and warm decors. The larger tables were place spaciously in between one another, however, the smaller four-seater tables were placed quite close to one another. Service was courteous but slow. 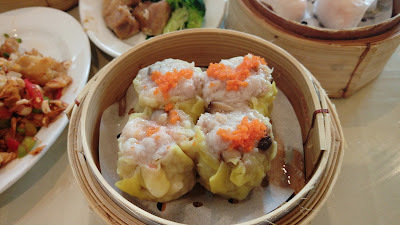 The Steamed Prawn Dumpling 水晶蝦餃 was very disappointing. The poor quality shrimps were fishy and overly soft. The translucent wraps had a weird chalky taste that lingered on the tongue for a long time. Not recommended. The Steamed Pork Dumpling 飛魚籽燒賣 had an unbalanced ratio between the fat and the meat. The visible chunks of fat in the blend were quite disgusting. The stuffing had very limited amount of tiny shrimps, almost unnoticeable. Heavy use of baking soda was also quite obvious. 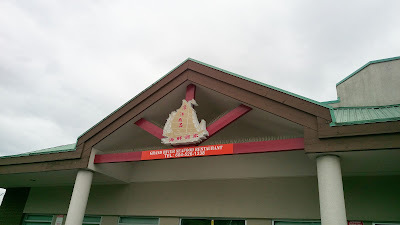 The Steamed Chicken Feet with Black Bean Sauce 豉汁蒸鳳爪 did not satisfy Buddha Boy's cravings. 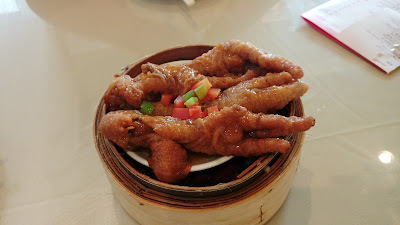 The chicken feet were not cooked long enough to deliver that fall-off-the-bone character. These were salty and the black bean taste was next to none. 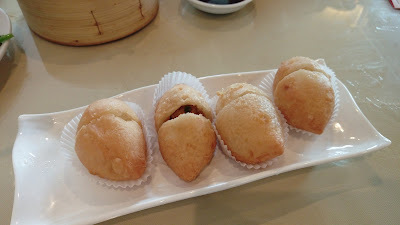 The Deep Fried Pork Dumplings 港式鹹水角 was another failure. 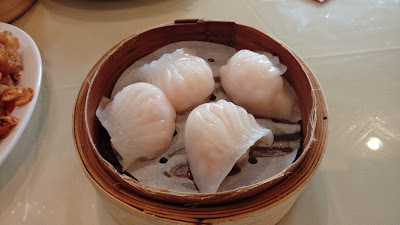 Not only these were dull with inadequate amount of pork filling, the dough lacked that mochi glutinous texture. The outer coat had an awkward flour-paste doughy chew instead of the common rice-flour bubbly crisp. Don't waste your money on this. 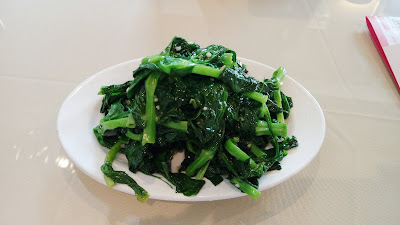 The Snow Pea Tips with Garlic Sauce 蒜蓉豆苗 was one the three dishes we enjoyed. While the garlic taste was minimal, the greens were fresh and had that gentle crisp crunch. 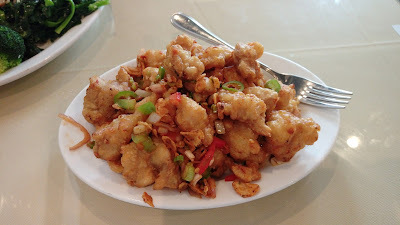 The Deep Fried Chicken Soft Bones with Chili Sauce 椒鹽脆雞膝 was another delightful dish. The chunky pieces were coated with a light batter then deep fried before tossing in a spicy finish of garlic, scallions, onions, chili pepper and salt. 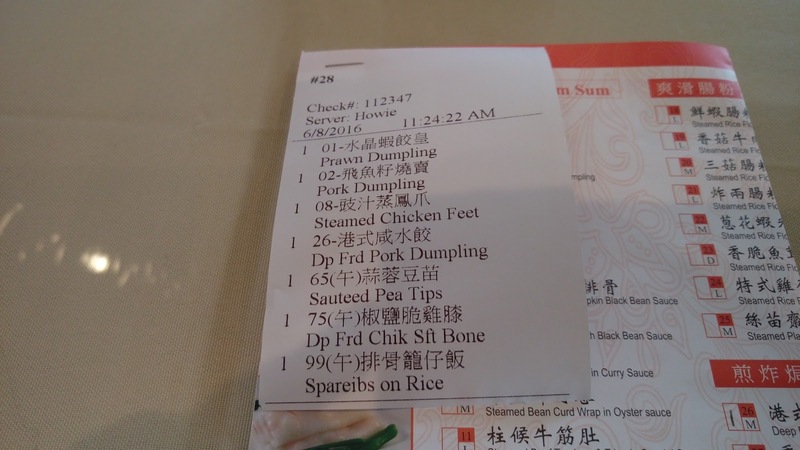 The menu stated that a minimum order of three regular-priced dim sum items would entitle the table to one Spareribs on Rice 特價排骨籠仔飯 at $2.99CAD. Of course, knowing us, we just simply could not take a pass on the deal. 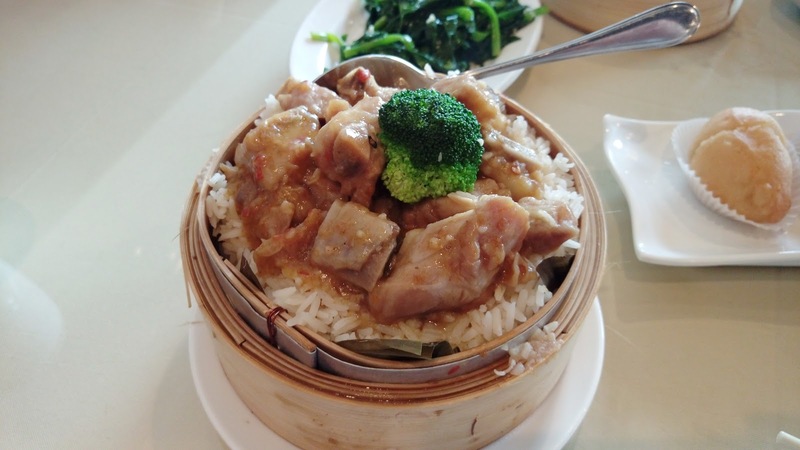 At a discounted price, this was a sizeable portion with generous amount of chunky and meaty spareribs. Unlike the chicken feet dish, the black bean sauce here played its role appropriately. The only miss was the ribs needed to be cooked a bit longer to reach that easy bite tenderness. 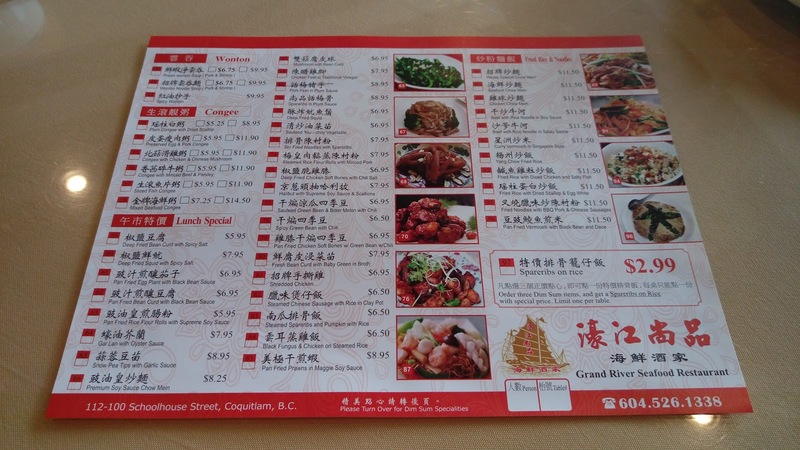 Grand River Seafood Restaurant 濠江尚品海鮮酒家 offers a dim sum menu with close to one hundred items to choose from. 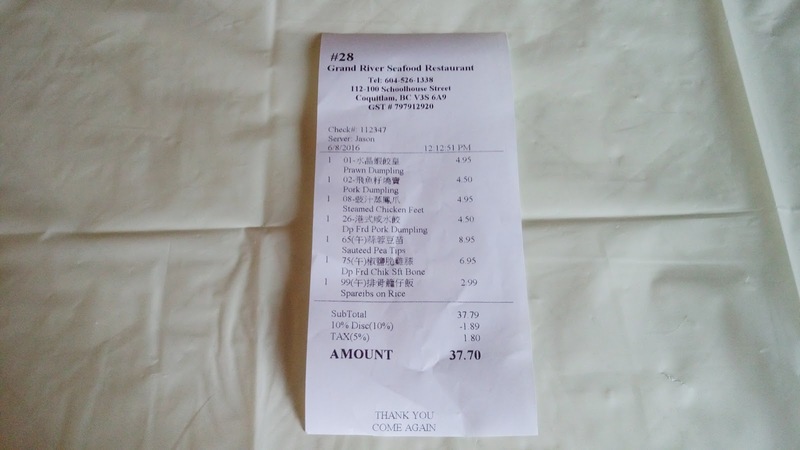 After the 10% discount and the 5% tax, our bill was $37.70CAD. 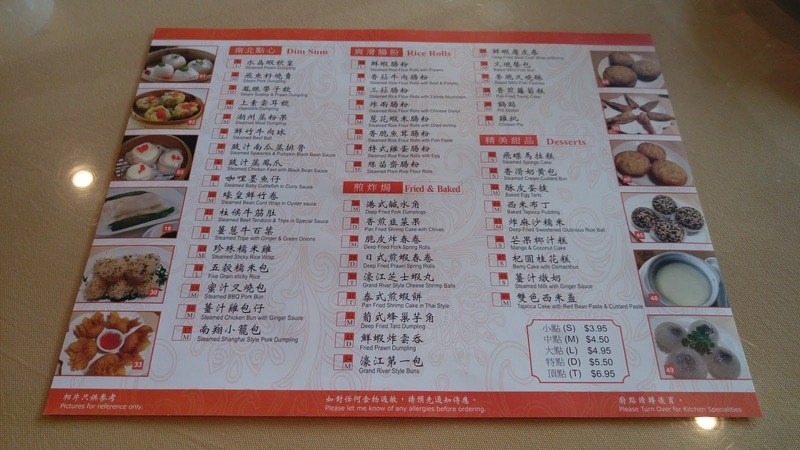 Menu prices were reasonable but there were more misses than hits, especially when it failed on the common dim sum staples, such as har-gow and siu-mai. Would we return? Yes, simply because there's really not that many dim sum restaurants in Buddha Boy's work surroundings.